What is going on with this cover? I can’t wrap my head around anything here. None of it makes sense. Why is there a bottle opener? Are we gonna enjoy some refreshing microbrews? And what’s up with Green Skull? Is this an early version of a Captain America comic where they hadn’t gotten certain details nailed down yet? Or maybe it’s a new comic where Red Skull has blasted himself with Gamma Radiation while trying to make himself into a Hulk? If that comic hasn’t happened, I’d be surprised. Green Skull is wearing a hat that is also a city, so there you go. That’s a thing that’s happening. I suppose you’re all waiting to know if there’s a connection to the book here, and I’ll bet you won’t be surprised when I tell you that no, there is no connection and I’m not entirely certain why some people are allowed to have the jobs they do. The back cover is roughly accurate, though. It’s just the two paragraphs, so I guess there’s not much room for whoever wrote that copy to go awry, but we’ve all seen worse, for sure. The only complaint I have is that there’s no mention in the book of Euri “avoiding the tranquilizing drugs all are required to take.” I don’t think people are required to take any drugs at all in this civilization, and Euri hasn’t been avoiding them one way or the other. He takes drugs along with everybody else. Euri is an interesting case, though. Yes, his full name is Euripides Che Fourthojuly 1070121 but that comes up one time in passing and is never mentioned again. It’s also never established if other people in this world have weird names or if it’s just him. It would make some sense that he’s the only one with a name like that because he’s so unique and special and wonderful and protagonistic that it’s just unbearable. The setting of this book is your standard dystopian city on a ruined Earth and the city provides everything for everybody and everybody has his or her place in the world and nobody particularly wants anything but there’s also a lack of freedom so I guess that’s a problem. Like so many books from this time period, you can trace more than a few of its themes and ideas back to Brave New World. And like so many of these stories, the protagonist just doesn’t fit in, because otherwise you wouldn’t have a story. I get that. If you’re going to make a story where people are being basically mind-controlled their entire lives, the only way you can actually turn it into a real story is to make your protagonist an outcast, and most likely some kind of throwback that the audience can relate to. There’s usually not a point. —of genetic engineering behind his DNA strains, but rather pure random chance. All he seems to do with his life is talk about how awful it is. And his society encourages that for reasons I didn’t fathom, although I think there was something in there about how he provides such an amazing opportunity to study happiness and the lack thereof. This is referred to as the debt society owes him. I’m starting to feel like perhaps this part of the book is railing against welfare states or something like that, but I have no idea and there seems to be so little information about Colin Anderson on the Internet that I am unable to figure out what his political views might well be. The first half of the book, down to the very page, is an exploration of the City-State of Magellan, which is the last city on the Earth. At some point or another some bombs fell and some missiles launched, and now the world is a wasteland, although an interesting variation on the post-nuclear wasteland theme because this is a verdant wasteland, occupied entirely by plants that were already tough enough to survive the nuclear war and just got tougher. A lot of this portion involves Euri, his wife Chrys, his “Servant” Bubo, and Bubo’s wife Leni. A Servant is basically a full-time psychologist. It’s Bubo’s job to keep Euri happy and he is a failure. They talking-head at one another for about eighty pages, then there’s an illegal sportball game where Euri kills Bubo, and then Eternity happens. Here’s the thing about Eternity. There’s a giant computer. It’s located at the center of the Earth. People built it. It is called Chronophage, even though I’m pretty sure it never once ate any time. Chronophage is set to turn itself on at midnight that night, so the entire first half of the book takes place on the eve of the singularity or something like that, which you’d think would have everything to do with the emotional tone or the things that happen, but it doesn’t and it’s like it hardly matters except it gets mentioned every, oh, two or three paragraphs. Chronophage gets turned on (hehe) and at first Euri doesn’t find anything different, other than he is alone now. He looks for people and can’t find them. At some point he decides that he can’t spend Eternity without his wife Chrys—who has, I’m sure, one line of dialogue in this book—because that would be awful. So he goes and looks for her. Along the way he has this sort of Pilgrim’s Progress thing where he meets people and the “paradises” they’ve created. The deal with Chronophage, Eternity, Liberation, or whatever, is that the computer is connected to every man, woman, and child on the planet. They need merely think something and Chronophage will make it happen. Everyone gets their own way to spend Eternity, because no two people’s paradises will align perfectly. Also, it’s called Eternity because everybody is immortal now, seeing as how Chronophage, with its complete and perfect control over every atom on the Earth, can keep people alive even without food or water forever. The book even states that in a couple billion years when the sun explodes Chronophage will still be running and keeping everybody alive because by that point it will have figured out new energy sources to use or something like that. Euri meets a person who has transformed themselves into some kind of living castle. This has something to do with art, I think. Another person was called Sir Daddy and was a sort of preacher surrounded by hollow-eyed children spirits. I got the feeling that maybe he was an allegory for religion. Yet another guy was found living in a simple cottage and kept talking about how busy he used to be before Eternity and how he expected his responsibilities to increase after Eternity but now he’s just looking after this garden and he gets very angry if something happens in his garden that he didn’t cause. Euri finds out at some point that this guy was just some kind of minor bureaucrat, loathed and pitied by most people, before Eternity happened. So Euri bounces around between these things while looking for his wife. What’s weird to me is that up to this point there seemed to be no indication that Euri loved his wife or even gave a crap that she existed. Euri’s personality up to this point was one of pure selfishness and pointless anger. But I guess the author needed to give him a reason to wander around this post-Singularity wasteland and this was one. And so Eternity ends and Chronophage leaves and the entire human race is reduced back down to caveman times. Euri finds Chrys, who has been pregnant throughout the book and I forgot to mention that. There are some slight struggles and then Chrys has her baby and I guess that’s supposed to symbolize hope or something also did I mention that Chronophage left with about ten pages remaining in the book so this little coda has absolutely no time to emotionally resonate or make sense. I don’t think I had a pleasant experience at any point in reading this book. But! I’d like to point out that it had a strength. This book did do an excellent job at seeming visual and cinematic, though. That’s not something I encounter a lot. I found this world very easy to picture, and when the really weird things started to happen, I was able to seem them clearly as well. I started to get the feeling that this book would have worked much better had it been a graphic novel and we could get the full impact of things described. All-in-all, though, this book was the work of somebody who had an idea that he took very seriously but, as we all know, an idea is not a plot and won’t hold a story together by itself. This book didn’t even seem to have consistent ideas throughout it. It was like listening to somebody describe a dream, and we all know what a chore that is. I didn’t hate this book, but I’m not happy with it. It had a lot of promise. I think a book that takes place on the day before the Big Computer is turned on and gives everybody omnipotence has a lot of potential. It would be a great way to examine how people would react to perhaps the largest possible change in lifestyle, and perhaps that’s where this book really fell short, because the emotional tone of this book was nonexistent in a place where it should have been the forefront of the story. 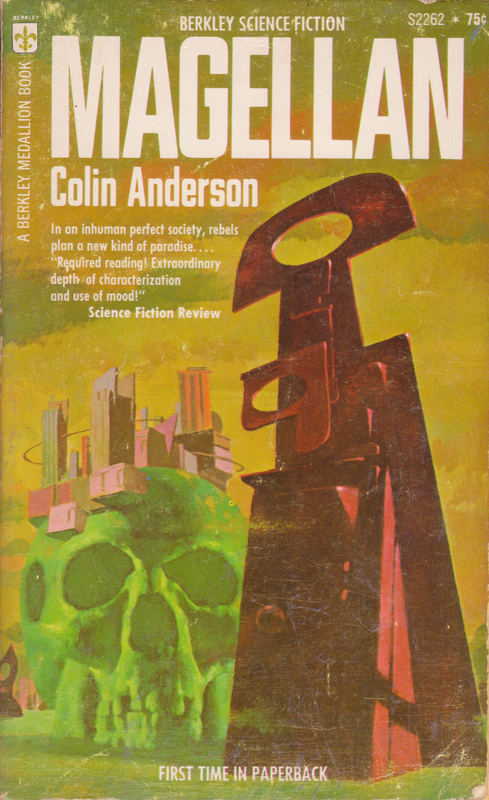 This was Colin Anderson’s only science fiction work, which is kind of a shame, seeing as how this book had so much unfulfilled promise. I’d’ve liked to see him get better at the genre and really knock something out of the ballpark. Alas. Your assessment, “I didn’t hate this book, but I’m not happy with it” was mine exactly — although I read it years ago I do remember the very intriguing city, the cover, and a feeling that it could have been so much more! When I was Google searching this book I did notice you had reviewed it but I held off on reading your review until I’d finished mine. Looks like we came to a lot of the same conclusions. I seem to have concluded that the prose was simply to bland/inarticulate/clunky to convey the ideas he so desperately wanted in the novel…. Oh gosh, I forgot to mention the prose and the author’s fixation on the word “which!” It grated in my head like rusty sandpaper! …but for some random thing I pulled off of the shelf due to the ridiculous cover, not so bad! How does one build a computer at the center of the earth? And why? I think they made some kind of self-building computer and planted it there so it could grow itself, which really doesn’t answer either question.